there’s no doubt about it, only the toughest warriors have the balls to survive the intensity of a full-fledged MMA match. Done in a cage, no less – an MMA fighter must last three five minute rounds until someone emerges victorious. Although the likelihood of any regular Joe fighting in the cage is highly unlikely, almost anyone can grow a pair and learn from the fearlessness MMA fighters portray in the cage. You could be the most badass fighter, with all the natural athleticism and sub-human endurance your coach has even seen. But if you don’t put in the time to train and show how committed you truly are, you won’t get anywhere. There’s really no shortcut to success. 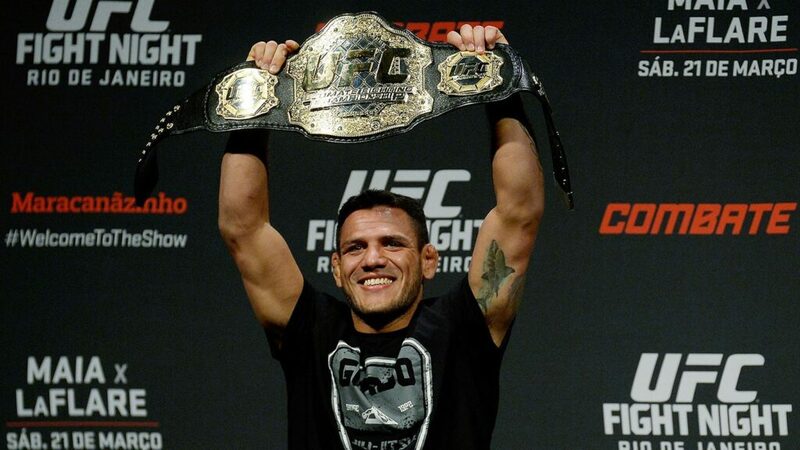 UFC Lightweight World Champion Rafael Dos Anjos had to experience his share of losses before he achieved his goal of becoming a champion. Lesson: Nothing worth having comes easy. Don’t be lazy and put in 100% of your mind, body, and soul into making your dreams a reality. The more determined you are, the faster you’ll get there. ONE Superstar Angela Lee is determined to become Singapore’s first WMMA World Champion! Nobody is perfect and there’s no such thing (sorry, Dana White) as the “ultimate fighter”. Everyone has something they need to improve on. MMA fighters (with the exception of Rory Macdonald and other fighters who have trained pure MMA) are usually better at one art over another. Wrestlers and BJJ Black Belts, for example, would have better ground games than Muay Thai fighters or boxers. Because MMA encompasses many different forms of martial arts, it takes this aspect into consideration and encourages the fighter to work on his weaknesses. Lesson: Open your mind (and ears) and be willing to learn and adapt. We are all in a constant state of learning, regardless of whether we practice martial arts or not. Everyday is a chance to learn something new and work on becoming the best version of ourselves! MMA legend Kasushi Sakruaba and ONE Lightweight World Champion Shinya Aoki are true inspirations for any MMA fighter. Nothing says more about a martial artist than the way he treats his opponent. There are manymartial artists who choose to disrespect their opponents by behaving in a very unsportsmanlike manner. They may choose to insult their opponent or refuse to shake their hand after a match – whatever they do, it definitely doesn’t reflect the values one learns from martial arts. If you train MMA, you know how difficult it gets. There are too many things to work on and sacrifice. Everyone deserves respect because everyone works hard to be where they are. Lesson: Have you ever heard the saying : “Be kind, for everyone is fighting a hard battle”? By applying this approach on how you deal with others, it becomes easier to be patient and more understanding of people’s feelings. BJJ World Champion and ONE Superstar Bruno Pucci has won all of his fights via rear naked choke. The toughest and most successful MMA fighters have one thing in common: their resilience. They know that they need to clock in the work hours and work on their mental toughness in order to succeed inside the cage. Those who train MMA know that to be successful, they need to make many, many sacrifices just to have their hand raised in victory one day. Anyone can say they want to become a champion but actually putting in the work is a different story. ONE Strawweight World Champion and multiple-time Muay Thai World Champion Dejdamrong Sor Amnuaysirichoke can certainly teach us about resilience. The 37-year-old retired Muay Thai fighter recently turned MMA World Champion’s story is definitely one that could inspire us all. At an age where an MMA fighter would usually be considered past his prime, Dejdamrong proved everyone wrong and showed that he was capable of training and excelling in MMA – just because he wanted it so bad. Lesson: Never give up on your dreams and don’t let anyone discourage you. Your dreams too, can become a reality someday. When you believe in yourself enough, the rest will surely follow. Anyone can be a champion in their daily lives as long as they are brave enough to do whatever it takes to get there. We can certainly learn from the habits that make MMA fighters champions in and out of the cage, and use them as inspiration to live our lives to the fullest. There’s a warrior within us all. All we need to do is have the courage to unleash it.